Springtails are small soil-inhabiting insects. They occasionally enter homes, particularly during periods of hot, dry weather. Springtails are typically 1/6 to 1/5 inch long and wingless. The most common species in our area are whitish-gray to brown color, although you can find species that are lavender-red or metallic blue in color. They get their name from the ability to catapult themselves through the air by means of a forked tail-like structured called a furcula (see image at right), which is attached on the underside of the abdomen. The ability to "leap" in the air often leads people to assume that these are small fleas. Springtails can be found almost everywhere outdoors. They live primarily in the soil, in leaf mold, organic mulches, under tree bark, in decaying logs, and may even infest potted plants. They are most abundant in damp or moist areas. Some species are found outdoors in the winter on snow-covered surfaces and are called "snow fleas". 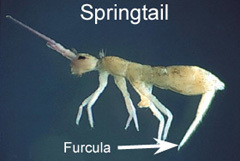 Springtails play an important ecological role as decomposers. They also feed on algae and fungi and a few species may damage commercial mushrooms and seedlings in hotbeds and greenhouses. As the soil/mulch dry out during prolonged periods of dry weather, the insects will move. They may be found congregating near any source of moisture, such as air conditioner condensate lines, lawn sprinkler heads, etc. They will be seen in large numbers that give a soot-like appearance on walls, floors, driveways, etc. Eventually, they make their way indoors. The most common areas where they're being found are your obvious sources of moisture, such as around exterior doors and windows, in sinks, bathtubs and around commodes. In many cases, springtails may be so numerous around sinks and tubs that people assume that the insects are coming out of the drains. 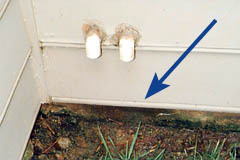 Springtails may also enter the living areas of a home from the crawlspace. The insects are often reported in and around new commercial and residential construction, possibly because they were brought in with freshly spread topsoil and mulch. In some cases, springtails may crawl onto construction materials stacked at a job site and may be accidentally "built in" to a house under construction. However, when construction is completed and humidity levels drop indoors, the springtails should die off.